In 2015/2016 a large number of refugees arrived in Norway. This caused long waiting periods and stress among the refugee seekers due to the delayed asylum process from the Norwegian migration authorities. The refugees were often placed in isolated asylum centers outside the cities with limited opportunities to contact with the Norwegian population. The lack of social platforms and activities caused high levels of stress, passivity and even mental illnesses among many of the asylum seekers. In addition regular work permits are not allowed during the asylum seeking process. This project focused on improving the waiting period by engaging the refugees in integrating into the Norwegian society. CO-work is an application service that allows asylum seekers to apply for voluntary jobs or internships while waiting to complete their asylum process. The service offers an opportunity for the refugees to expose their competences and qualifications as well as providing a possibility for companies to contact them. 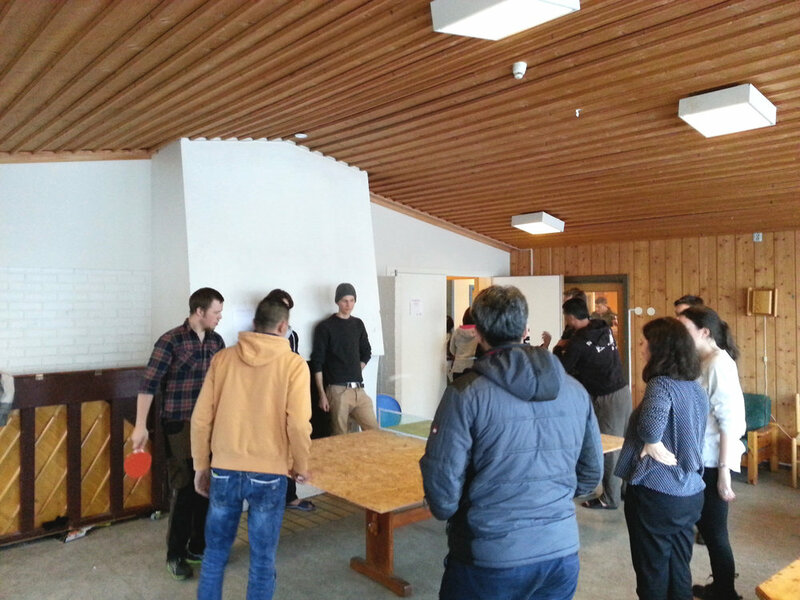 CO-work offers refugees the opportunity to have a more meaningful life while gaining work experience and knowledge about Norwegian language, culture and society. As many of the asylum seekers are highly educated and experienced this can also be a valuable resource for the companies involved. How might we help the refugees to feel more useful and valuable during their stay at asylum centers? A refugee creates his or her personal profile including education, previous work experience, language skills or interests. After entering this information the service expose jobs relevant for the competences of the refugee. The companies enter their profile with descriptions of voluntary jobs available and are exposed to employees available. Both refugees and a company can then contact each other for further information and a possible cooperation. During our research process we visited different asylum centers and had informal conversations and open interviews, as well as workshops with refugees. We also observed the physical localities of the centers including dormitories, dining rooms and the surroundings. Considering the vulnerability of the refugees, we payed much attention to respect the integrity of each individual that we contacted. During our field work we visited six different asylum centers, where we spent between 2-8 hours at each visit. The size of the centers varied from 50 to 550 residents. Templates were developed in advanced by the team for the field notes and the questions to ask refugees and professionals during our visits to asylum centers. Several participatory observations were made in the centers with the intention to profound our understanding of the situation of the refugees. Different workshops were used as an easy-going tool for communication with the intention that nobody would feel any pressure to perform. Interviews with refugees from Afghanistan, Syria and Iraq, as well as with professionals working with refugees were carried out. Together with the refugees we explored the surroundings around the asylum centers that were usually situated in isolated forest areas. Some of the activities during our visits consisted of playing games and doing leisure activities with some of the refugees trying to reach a more reciprocal relation between us all. Sometimes language barriers occurred, which made communication through body language and gestures important for our mutual understanding. Using mapping as a method and communication tool, we asked the refugees to write down their thoughts on certain themes related to their situation, themes that we had gradually identified during previous visits. "We don't have anything to wake up for." While analyzing the material from the workshops we were able to discover some of the thoughts, experiences and feelings of the participants on their situation in an asylum center. We found a high level of passivity among the asylum seekers, due to a lack of activities and stimulation in the centers. In the long run the asylum system is thus running the risk of producing social welfare cases. A majority of the refugees expressed a strong desire to contribute to the society and a wish for meaningful activities. While staying in the asylum centers with their restricted way of life, many refugees expressed a need for more freedom and independence in their lives. Some of the refugees mentioned the feeling of being stigmatized as an asylum seeker in the society. As a result of this lack of activities, the refugees spent a lot of their time awake on their smartphones talking to friends and family back in their home country, playing games or learning Norwegian. Because of this the smartphone seemed to be their most valuable object for many and an important tool for communication with the world outside the asylum center. Our team therefore decided to develop an application service to open the possibility for more activities through voluntary jobs. By using post-its it was possible for our team to discover what features to include in the service, but also to understand how to structure the content and navigation. Sketching wire-frames provided a good overview over how to create the navigation through the service to facilitate its use for both refugees and companies. To improve our first user flow we carried out user testing with some of the refugees and experts. Two main aspects that were addressed by the users were to include a map to facilitate finding the potential company and make it easier to return to the "start page". In this project I participated actively in the whole process, from research to execution, including field work, facilitating workshops, ideation, logotype, analysis and report writing. From this project I got a deeper understanding of the process of taking a current problem in society as a point of departure as a designer, and participating in the process of developing a product. Another learning outcome was an increased awareness of how transcultural communication can take place through a service, further more the importance as a designer to reflect upon cultural diversity and to search for an intercultural approach. © 2019 Selvi Olgac. All rights reserved.